Two things terrified Peter Hamilton as a child growing up in Melbourne: a disaster like a bushfire overcoming his family, resulting in him being thrown into a horrible orphanage, and polio. "I often saw children struggling inside their steel calipers to walk across our schoolyard. But I loved to run and jump. I wanted to be an Olympic high jumper. I couldn't bear the thought of being grounded by crippled legs. And, then, suddenly, we all lined up for our polio shot, and my terror of polio vanished," Hamilton said. 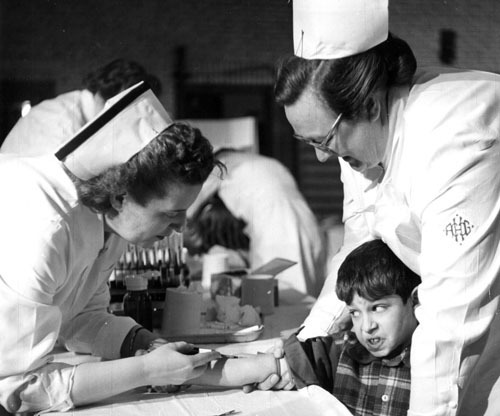 Remnants of that fear and the relief at being vaccinated triggered an emotional connection when he saw an early version of the film about American scientist Jonas Salk's struggle to find a vaccine to stop polio in the 1950s. As a seasoned consultant for non-fiction television producers and channels, Hamilton was determined to find a broadcast home for this story: "Television production is extremely risky, and I only work on a project if it is likely to be winner. I was confident that the Smithsonian Channel would be open to a film about one of the great success stories of American Science." David Royle, the executive vice president of programming and production at the Smithsonian Networks agreed with Hamilton and A Shot to Save the World is set to premier on World Polio Day, today, October 24. Like Hamilton, Royle saw this "an incredible tale about how the American people came together on a massive scale" to conquer a scourge on humanity. The film shows that although supported by the polio poster child in chief, President Franklin Roosevelt, who used the bully pulpit to whip up support for the effort, average citizens under the banner of the March of Dimes carried out the hard work, and fundraising. No government funding went into the research that resulted in Jonas Salk's vaccine. What also interested Royle was that the story resonated today due to the extraordinary efforts of Microsoft founder Bill Gates, through the Bill and Melinda Gates Foundation and Rotary International, in cooperation with the World Health Organization (WHO), the Center For Disease Control (CDC), UNICEF and others to finally eliminate polio. "Last steps are always difficult," Royle said. Their goal is to stamp out polio by 2018 and they've raised over $3 billion to make it happen. There were 227 cases reported last year of this disease that was first chronicled in Egyptian papyrus scrolls. At the height of the polio epidemic in the 1950s, there were more than 50,000 cases reported every year in America alone. Walking that "last mile" means raising more money from people like Michael Bloomberg, who's given $100 million, and contributions from other members of the billionaire's club, such as another donor, Carlos Slim, as well as through donations to Rotary International that will be matched by the Bill and Melinda Gates Foundation. The goal is a little more than $5 billion. A target they are confident they can hit but the ultimate success also means overcoming political obstacles in countries like Pakistan where aid workers attempting to vaccinate children are routinely targeted by militants and killed. This is partly a backlash to the CIA's use of doctor Shakil Afridi as part of the attempts to track down Osama bin Laden. The doctor's work had nothing to do with polio. Afridi used the cover of a hepatitis B vaccination campaign to collect blood samples in order to find people who matched the Bin Laden family DNA. It was a fruitless ploy and the furor sparked by the revelation earned him a 33-year jail sentence that was later overturned. But it's added to the already difficult task of working in remote tribal areas where acknowledging anything the United States or the West has to offer is fraught with peril. The victory of the eradication campaigns in other countries like India gives those working on the three countries that remain polio endemic Afghanistan, Nigeria and Pakistan, and the others like Syria and Somalia where there have been outbreaks, hope that polio like smallpox will one day be history. What Salk and others accomplished in the 1950s inspired Pittsburgh-based (the town where Salk did his research) professor and head of Steeltown Entertainment Project, Carl Kurlander, who shot to fame with his semi-autobiographical coming-of-age film, St. Elmo's Fire, to dedicate several years to telling the Salk story. "It's a great metaphor for what is possible for people. Kind of a Rocky story," he said. For Salk's son, Peter, the film was also more than just a tribute to his father's heroic and selfless efforts (he never patented the vaccine) it was an opportunity to show that we can finally get rid of polio forever and that "would be a triumph for the world," he said. A Shot to Save the World: co-executive producers Stephanie Dangel and Peter Hamilton (DocumentaryTelevision.com.) Directed by Tjardus Greidanus and produced by Carl Kurlander and Laura Davis of Steeltown Entertainment Project. Executive producers for Smithsonian Channel: Joy Galane, Charles Poe and David Royle. International distributor: Tim Sparke / Mercury Media International. Check Smithsonian Channel for broadcast times.